To make it easier for you to decide on the best way to erect your Biohort Annexe CasaNova, we have prepared some proposals for you regarding foundation design. The simplest form of erection is to install your Annexe directly on to a Biohort Floor Frame and secure this with the ground anchors provided. The Annexe CasaNova is an ideal storage solution for your garden. 1. Earth is removed from the erection site (lawn or soil) to a depth of roughly 20 cm. (Allow for size of Floor Frame plus all round clearance). By erection on uneven or sloping ground, sufficient compensation must be made to ensure the foundation is level. 2. Fill the foundation pit to within 2-3 cm of the top edge firstly with gravel (16/32 size) and then with finer gravel (2/4 size). The prepared area must be completely level! (Please use a spirit level during the preparation). The aluminium Floor Panels which are available as accessories can now be easily installed (see below). We recommend that a layer of polystyrene panels of ca. 3 cm thickness be laid underneath the Floor Panels. In this way the ground anchors can be hidden from sight. 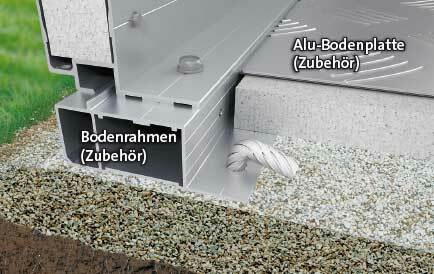 If aluminium Floor Panels are to be NOT installed, a moisture barrier (plastic sheet) should be laid out in the gravel. Please ensure that the film does not protrude beyond the outside edge of the Floor Frame! Another useful alternative to assure the level and storm-proof erection of the Annexe on uneven and soft ground is to combine the Biohort Floor Frame with a point foundation. The foundation points should be positioned at each of the four corners and along the sides underneath each upright. Two point foundations are sufficient at the front and back of the Annexe. Dimensions of foundations: 30 x 30 cm with a depth of approx. 80cm. The effect of moisture rising from ground level can be reduced by laying out a moisture barrier in the form of plastic sheeting. This must be laid out across the top of the point foundation and over the complete area of the Annexe. The Annexe shall be erected onto the Floor Frame and attached to the foundation with the materials provided. A concrete slab with a thickness of mind. 10 cm is the optimal foundation. Scoop the building ground to a depth of ca. 60-80 cm (frost-proof depth!). Build a substructure consisting of a ca. 60-80 cm compacted ballast bed (granulation up to35 mm). Install a levelling fill of ca. 3-5 cm (granulation up to 6 mm). Insert a plastic foil (not larger than the concrete foundation, thicknes mind. 150µm). 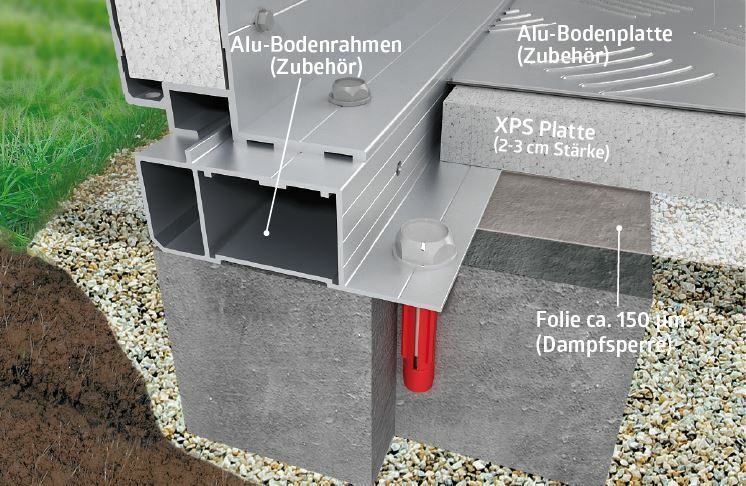 Build the concrete foundation (reinforced with 1-2 sheets of construction steel grids, thickness 10-15 cm).With this foundation option, you have to ensure, that no water can soak in the ground of the outside area of the Annexe. 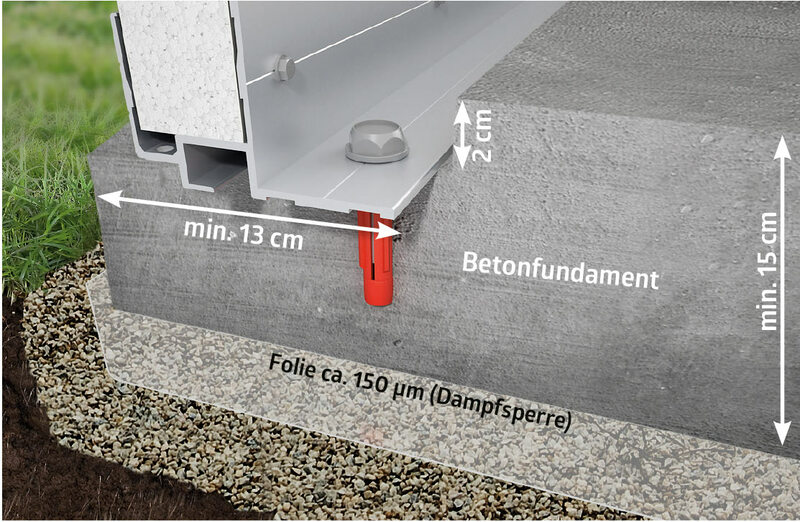 Here, you should seal the soil profile from the buttom up (in the outer area of the soil profile between the foundation and soil profile) with a metal compatible building sealant (we recommend a permanently elastic butyl sealant). If you want to insulate the ground, we recommend the floor frame. With additional XPS-hard foam panels (ca. 2 to 3 cm), you reach a ground structure with an integrated insulation of 4 cm.